UR Danny Cronin - IL - 6-3//185 - Fenwick - Could ND take in 2 if Avery Davis is moved from QB? 4* Darvon Hubbard - AZ - 5-11/205 - Chaparral - From OH - OSU Commit w/ QB Jack Miller - trouble in paradise? 3* Tee Hodge - TN - 6-1/195 - Lives just outside Knoxville & named Tee... not good. Visit for FSU. 4* AJ Henning - IL - OFFER - 10.6 100m Fr. year - Lincolnway East HS #1 in IL - Wiltfong CB - Rocket like APB? UR Marcellus Moore - IL - 5-8/165 - 10.31 100m IL SC as Soph - If speed kills, he's the plague. 4* Daniel Jackson - KS - OFFER - 6-0/180 - Bishop Miege - 54/1270/16TD -Jafar's cuz - ND passing? 4* Terry Locket - MN-->OH - 6-0/170 - Spire - pkg deal w/ Kaden Johnson? UR Tommy Guajardo - MI - VISITED & Camped 6-'18 - 6-3/190 - One to watch? 3* Jack Yary - CA - 6-6/250 - HOF Ron Yary's son. SC's to lose - Future OT? 3* Jack Yary - CA - 6-6/250 - HOF Ron Yary's son. Rated at TE - Future SC OT or TE? 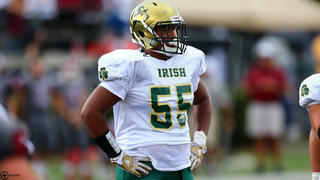 3* Golden Achumba - DC - 6-4/320 - MI/L offs - DeMatha - Offer on name alone. 4* Jaheim Thomas - WDE - OH - OFFER - Visited - Listed at OLB - Tough pull but will OSU pass? 4* Jordan Burch - DE - SC - 6-5/250 - BK follows - Clemson's to lose. 4* Ethan West - ILB/DE - VA - 6-4/220 - Cosby HS - ILB/Flex/OLB/Drop/ATH - Will blow up - Offer Now! 4* Kaden Johnson - OLB - MN - 6-4/205 - Minnehaha - Will blow up - Offer Now! 5* Antoine Sampah - ILB - VA - 6-2/220 - Woodbridge - No Asst's follow - hurdles? UR Jaylyn Allen - LB - KY - 6-1/220 - Nice film - from the country music capital of the world, Painstville, KY.
3* Landen Bartleson - KY - OFFER - 6-1/185 - Visit 2-23 - 159/1150/20TD/3recTD/1Int-P6/46 Tkl - 10.95 100m (State Champ) - Great JR film - DB/RB/WR/DB? 3* Semaj Brown - IL - 6-2/185 - TF North - Visited 4 Pitt - Syr/Neb/KU offs - Is he a WR/S/Rov? 4* Makari Paige - MI - 6-3/185 - Visited - W Bloomfield HS - 1000 yd rusher So year - Rover? 4* Bryson Washington - TX- 6-3/198 - perfect Rover prospect. 4* Lejond Cavazos - TX - OFFER - VISITED 2x - Transferred to IMG So. yr.
4* Chris Thompson - TX - OFFER - 6-2/180 - Duncanville - TX leader - Bama off too. 4* Dre Lambert - VA - 6-2/180 - OFFER - Kam Chancellor's nephew - WR but a better DB? 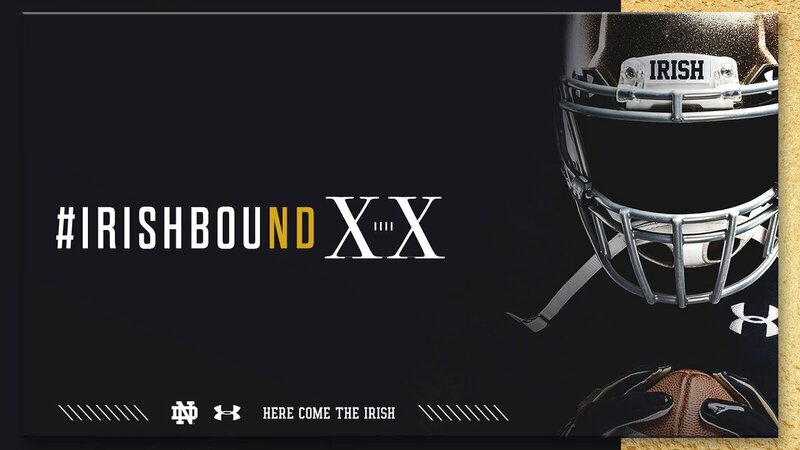 Last edited by NDCrusader; 04-19-2019 at 10:39 AM..
Staff in to see Johnny Wilson (among others), the #1 WR in 2020 IMO. He had 850 yds / 14 TDs receiving on a loaded Calabasas squad that featured 4 other WR's that are going major P5. SC and Nebraska have already offered among others and it seems the Cornhuskers already have their hooks in. Calibraska is in full effect. I did a search and oddly enough I found it being used on a ND's Equestrian site. Strange. Last edited by NDCrusader; 11-13-2017 at 09:45 PM.. 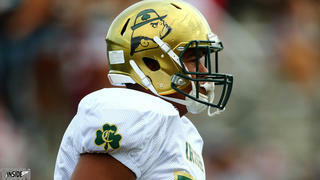 When I first saw it I figured it was from Notre Dame HS where CJ Sanders went. It's in Sherman Oaks just 15 minutes down the 101 from Calabasas but it's not. i did a search and oddly enough I found it being used on a ND's Equestrian site. Strange. Would like to see HH and CL get in on Bryn Tucker early and use some of Harrison Smith's star power on him. Pretty easy sell when you put together your school's top alumni and your recent success at OL.. That's an unbeatable pitch and we've got a lot of IE bagmen out near Dollywood. Kid's as close to a can't miss OL as you'll find. Bama and OSU already in. Teammate of 2018 5 star OT, Cade Mays and 2020 OL Cooper Mays. Last edited by NDCrusader; 10-29-2017 at 11:03 PM..
You gotta quit drinking with Nuke.